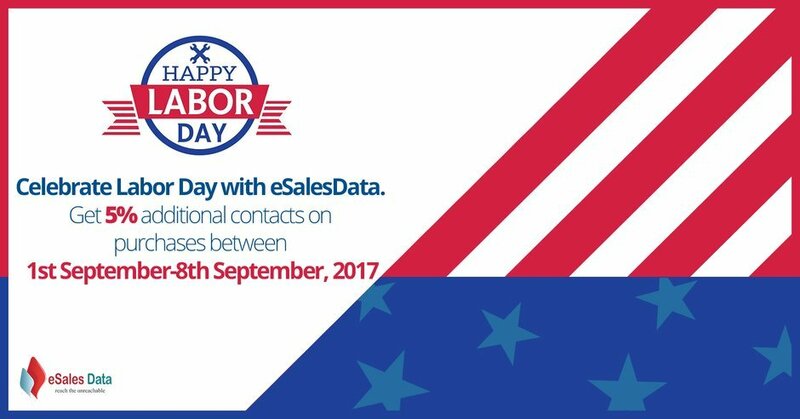 August 30th, 2017: As the day of honoring the contributions made by the workers in building the Nation approaches, eSalesData is all set to make the day of honoring even more special and noteworthy for all the businesses by offering 5% extra contacts on all B2B Email Lists purchased between September 1st – September 8th, 2017. In the United States, Labor Day is celebrated on Monday, 4th September 2017 but the celebration will start right from the weekend and continue the following week. Adding to the grand day is eSalesData’s special offer that will be lucrative for most of the business as they will get access to an additional amount of accurate and up-to-date data. The offer will kick start on 1st of September and will extend till 8th of September, 2017. With over millions of contacts in the record, eSalesData’s mailing and email lists help organizations reach their targeted prospects at their right inbox to market their products and services without any hassle. Each record in the database undergoes a strict process of verification, validation, and authentication to ensure maximum deliverability of marketing messages. eSalesData’s B2B email list comprises only relevant information and does not entertain any obsolete or incomplete details. Committed to delivering a quality list that drives better lead generation and revenue, the eSalesData team pays individual attention towards creation of every list of email and mailing addresses to ensure that the email list stands up to customer expectations. With network across the globe, eSalesData gives their client access to data from global markets. Lists are updated every 90 days to ensure 90% deliverability. And all leads come with critical marketing information that includes first name, last name, title, phone number, mobile number, fax number, email, SIC code, postal address and zip code.